Explore some of the beautiful and often surprising treasures found right under our feet in this exhibition featuring 90 specimens from the Canadian Museum of Nature’s collection and supplemented by specimens from the Timmins Museum: NEC’s geology collection. A travelling exhibition developed by the Canadian Museum of Nature. An exhibition by the Porcupine Handweavers and Spinners Guild to coincide with the Weavers and Spinners of Ontario North Conference. An exhibition by the Porcupine Art Club featuring recent works by local artists on the theme “Colour Riot”. For millions of Canadians, winter is synonymous with hockey. Hockey brings us together. It thrills us. It is part of our identity, our shared history. This exciting interactive experience will showcase high points in the sport over the past 100 years and will feature a selection of local artifacts. An exhibition featuring a series of painted Polaroid’s by Alana Pierini, of Iroquois Falls. It’s been 100 years since Manitoba granted the right to vote to most women, the first province in Canada to do so. The exhibition Nice Women Don’t Want the Vote provides an opportunity for Canadians to deepen their knowledge of voting and women’s rights, and the measures we still need to take in the fight for justice and freedom for all. 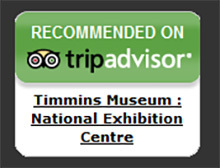 An exhibition featuring art from the Timmins Museum: National Exhibition Centre’s collection.